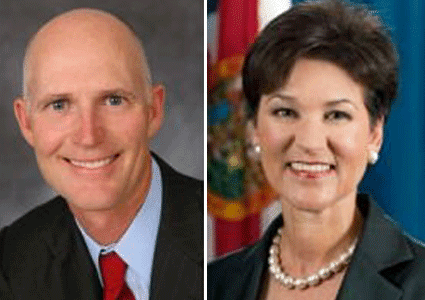 Last night was the second gubernatorial debate between Alex Sink and Rick Scott. The debate focused mainly on the economy and creating jobs, but LGBT issues were also addressed. The moderator asked each candidate if they thought homosexuality was immoral. Scott didn't answer the question directly, but rather, said he believes "marriage is between and man and a woman" and that children are better off "if they are raised by a married couple". Sink said that homosexuality isn't immoral and pointed out that Scott did not answer the question. When asked about the recent court decision overturning Florida's ban on gay, lesbian and bisexual adoption, Sink said she agreed with the decision to overturn the ban and that adoption should be based on the best interests of the child. For a full run down of the debate, visit the Sun-Sentinel.